(Nanowerk News) The Arizona Technology Council today announced the first digital edition of its TechConnect magazine to complement the highly popular print offering. By combining rich media within a digital publication that maintains the look and feel of the print magazine, the Council is providing readers with faster access to articles exploring the emerging trends and issues in Arizona’s high-tech community. Requiring no special software or “plug-in” downloads, the digital version ensures that every TechConnect reader has access to a full featured edition with the same departments, features and vibrant look they have come to expect. In fact, digital readers will have the experience of turning the pages of a regular magazine with the added convenience of availability anywhere they have an internet connection. 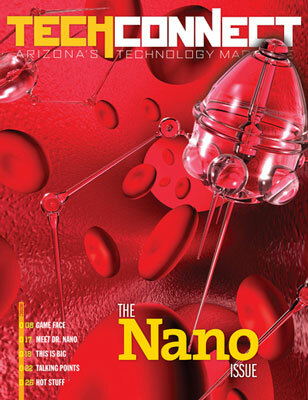 The focus of the premiere issue is nanotechnology, giving readers a glimpse into a field that produces innovations three orders of magnitude smaller than a human hair with enormous potential impact on the state’s economy. The issue will preview new products that incorporate the use of nanotechnology and provide insight into the issues surrounding its use. The Arizona Technology Council is a private, not-for-profit trade association founded to connect, represent and support the state's expanding technology industry. To promote economic growth and professional development in Arizona's technology sector, the Council provides members networking opportunities, business support and access to educational forums. The Council strives to distinguish Arizona as a leader in the technology community and offer resources that are exclusive to its members.